Former #United_States Secretary of State Henry #Kissinger spoke to truth when he said, “#America has no permanent friends, only interests”. The fact that the #Trump administration is prepared to overlook #Qatar’s terrorist ties to gain financial and military benefits lends credence to that wily veteran politician’s admission. Just seven months ago following US President Donald #Trump’s visit to #Saudi_Arabia, his very first foreign trip in office, he attacked #Doha for being “a haven for terrorism” and the terrorists’ chief financier. He later boasted that he had encouraged the Kingdom and its allies to distance themselves from their former brotherly neighbour gone rogue. It is known that I had my doubts about candidate’s Donald #Trump’s character and fitness for the job but I hoped he would not renege on his promises like his predecessor Barack #Obama who cuddled #Iran while disparaging Gulf States. Once elected, we believed we had a reliable partner. #Trump’s visit was considered a sign of respect for the historic alliance between #Saudi_Arabia and the #United_States. We were wrong. It was nothing but a media photo opportunity without substance meant to pacify the Arab World pushed aside by #Obama in the aftermath of his nuclear deal with the devil. The Saudi-led Alliance that includes the #United_Arab_Emirates, #Bahrain and #Egypt was prepared to re-embrace #Qatar on condition it agreed to implement 13 demands. The list included the severance of #Doha’s ties to the #Muslim_Brotherhood, #Daesh and #Hezbollah; the closure of its propagandist media outlets, the curbing of diplomatic ties with #Iran and an end to #Turkey’s military presence on Qatari soil. The Qatari Emir #Sheikh_Tamim bin Hamad Al-Thani played the innocent and pretended he was willing to talk about all issues of contention. However, rather than show goodwill, he has exacerbated the fallout by strengthening his country’s relationship with #Tehran and permitting #Turkey to deploy air and naval forces in addition to ground troops. Logically one might expect that the US government would frown upon the Emir’s fraternization with #Iran, the world’s biggest sponsor of terrorism, and might not be too pleased about a burgeoning Turkish military presence where US Central Command has its forward air base hosting 11,000 US and coalition forces – especially given that the relationship between #Washington and #Ankara is allegedly rocky. In reality, neither logic nor principles play any part in the shifting sands of Mr #Trump’s stance which has dramatically warmed in favour of #Qatar that has denied clear evidence concerning #Iran’s efforts to destabilize the region and, according to reports, is mulling the use of an Iranian island to host #Qatar’s World Cup teams in 2022. Perhaps #Qatar’s sweetener in the form of a purchase of US weapons worth $12bn sealed shortly after #Trump’s public criticisms was very persuasive. The writer cites the Secretary of State Rex #Tillerson’s recent effusive praise of #Qatar as “a strong partner and long-time friend” echoed by the Secretary of Defence #Jim_Mattis. 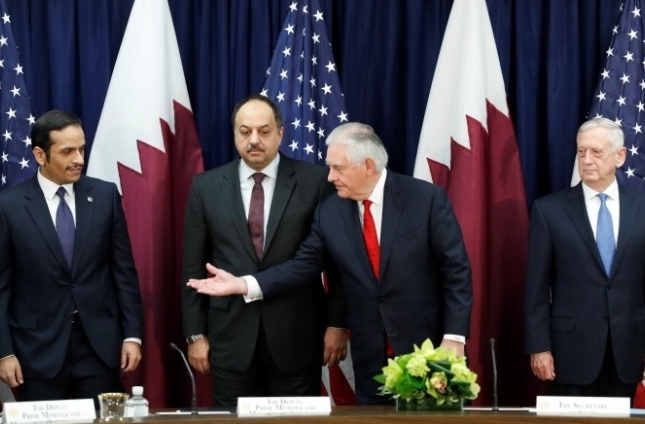 #Tillerson has always displayed a pro-#Qatar tilt, going so far as to blame Riyadh for the continuing rift. It is worth noting that #Tillerson’s relationship with #Qatar stretches back to his Exxon Mobile days when he described #Qatar as a model for other resource-rich nations. For a while #Tillerson and #Trump were at odds over #Qatar but the Secretary of State’s view has prevailed. On 15 January 2018, #Trump thanked the Emir for his actions “to counter terrorism and extremism in all forms” without detailing what form those actions had taken. #Qatar has wielded its dollars like a weapon and that is a language guaranteed to woo Mr #Trump’s avaricious mind. It has pledged massive future investments in the US. In 2015, #Qatar’s Sovereign Fund earmarked $45bn for investment in US infrastructure. It also owns more assets in the UK than the Queen which is likely the main reason why British parliamentarians are urging Prime Minister #Theresa_May to “compel” #Saudi_Arabia, the #UAE, #Bahrain and #Egypt to forgive and forget #Qatar’s treachery. Britain’s Secretary of State for Foreign Affairs #Boris_Johnson flew to #Kuwait and #Qatar to take on a mediator’s role and appears to have developed a liking to fly #Qatar Airways. #Qatar not only wants to make the Al-Udeid airbase a permanent fixture it is intent on expanding the US base to include gated communities for families, entertainment centres and other facilities geared towards the comfort of American troops stationed there. How kind of the Emir to be so concerned about the well-being of foreign military personnel! Some might call this open bribery. If so, the favour is returned. Under pressure, #Qatar has agreed to abide by the Open Skies Agreement. Its subsidies to #Qatar Airways, which American airlines have complained constitute unfair competition, will now be disclosed. Besides lobbying US lawmakers and important think tanks like the Heritage Foundation, senior Qatari officials have been cosying-up to American Jewish community leaders with invitations to visit #Doha. The Jerusalem Post revealed that Rabbi Menachem Genack who heads the Orthodox Union’s Kosher Division took the bait and flew to #Doha for meetings. #Qatar has hired seven PR firms in the #United_States to rebrand its image including one owned by an orthodox Jew. Seemingly the Emir believes that if he can grab influential American Jews into his corner, he will win the game. Israel, which has railed against #Qatar’s hospitality for the leadership of Hamas and its closeness to #Iran, is unimpressed. It is no wonder, especially when #Doha hosts the Egyptian #Muslim_Brotherhood leader #Yusuf_Al-Qaradawi in style, a man who has claimed God used Hitler to wreak the Holocaust on the Jews as a divine punishment. “Israel’s embassy to the #United_States does not support #Qatar’s campaign to improve its image in the American Jewish and pro-Israel community,” an embassy spokesperson told Ha’aretz. #Trump may be willing to tango with Tamim at the expense of #America’s tried and true friends and the same can be said with the brought and paid-for UK, but on no account should we be intimidated to fall into line. #Qatar’s ruler has sold his brothers down the river and if he imagines that #America will stand beside him once it gets what it wants, he is in for a shock.